Habit: Annual, perennial herb. Stem: prostrate to erect; internode often with sticky region. Leaf: petioled; blade 1--6 cm, paler beneath, often brown-dotted. Inflorescence: panicle-like, branches ending in umbel, spike-like raceme, or paired or solitary flowers; bracts 1--3, free, not forming involucre. Flower: closing by evening; perianth bell-shaped, tube < 5 mm, limb < 3 mm; stamens 1--5; stigma +- spheric, generally exserted. Fruit: < 4 mm, club-shaped; ribs 4--5; wings 0. Boerhavia coulteri (Hook. f.) S. Watson var. palmeri (S. Watson) Spellenb. Habit: Annual. Stem: decumbent to erect, < 8 dm, puberulent. Leaf: blade lanceolate to ovate-triangular, +- acute. Inflorescence: spike-like raceme; bracts << fruit, deciduous. Flower: < 1.5 mm; perianth pale pink to white. Fruit: 2.5 mm, glabrous; narrow, wrinkled between generally 5 wide ribs; tip rounded to +- truncate. Ecology: Gravelly hillsides, washes; Elevation: < 1450 m. Bioregional Distribution: ChI (possibly introduced), se DMoj (desert mtns and lower montane slopes), DSon; Distribution Outside California: to Arizona, Mexico. Flowering Time: Sep--Nov Note: Boerhavia coulteri var. coulteri expected as agricultural weed in southern California. Citation for this treatment: Andy Murdock 2012, Boerhavia coulteri var. 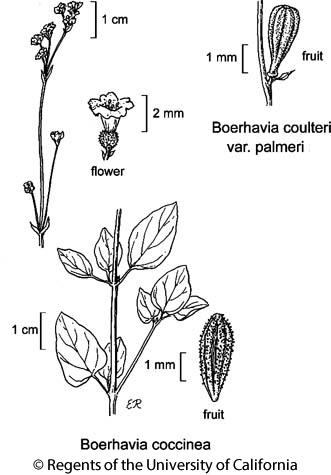 palmeri, in Jepson Flora Project (eds.) Jepson eFlora, http://ucjeps.berkeley.edu/eflora/eflora_display.php?tid=81377, accessed on April 19, 2019. ChI (possibly introduced), se DMoj (desert mtns and lower montane slopes), DSon; Markers link to CCH specimen records. Yellow markers indicate records that may provide evidence for eFlora range revision or may have georeferencing or identification issues. Purple markers indicate specimens collected from a garden, greenhouse, or other non-wild location.